Compare over 7,500+ different accredited nursing degrees online at Nursing Degree Guide. Our database has been hand gathered, using resources from the CCNE (Commission on Collegiate Nursing Education), ACEN (Accreditation Commission for Education in Nursing), the Integrated Postsecondary Education Data System (IPEDS), and other program specific accrediting boards responsible for program curriculum. There are a lot of nursing programs available - use our guide to figure out which path is the best for you. Figuring out which nursing degree you should pursue can be intimidating. There are a lot of nursing degrees available - so which one is right for you? It really depends on your current level of education. Use the guide below to figure out which nursing degrees you can pursue, and see the path to other degrees and careers. Welcome to Nursing Degree Guide, one of the most prolific nursing education resources on the web. We have researched, written, and spoken with expert nurses to help create the most useful nursing resource for you to find the right nursing program. 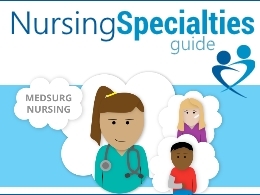 Nursing Degree Guide has interviewed practicing nurses, partnered with expert nurses to get their perspective in written format in every nursing program we have reviewed, as well as our "Articles" section. We have built one of the most extensive resources on the web - a directory of 7,000+ accredited nursing programs, complete with NCLEX pass rate data and other pertinent degree information. Our directory of ACEN, NLNAC, and CCNE accredited nursing programs was compiled by hand using data collected from the U.S. Department of Education, the U.S. Department of Labor Bureau of Labor Statistics, the CCNE, the ACEN, the NLNAC, and school administrators at various universities across the nation. See our research methodology for more information. Throughout Nursing Degree Guide, you will find detailed information on all of the nursing degrees available in the US at campuses and online programs throughout the United States. The field of nursing is as diverse as the people within. This career provides its professionals with a constant job pool that constantly seeks new talent. It is one of the largest populated careers in the United States, providing jobs for more than 2.7 million people country-wide (Bureau of Labor Statistics, 2015). There are several different possibilities for those seeking a career that is fitting for both personality and interests. Nurses are the front of most care facilities – providing assistance to patients that are in need of urgent care. For individuals that are seeking fast-paced and engaged settings, emergency room staff nurses are a popular choice. Those seeking a career working with children may be interested in school nursing. There is a place for every individual within the highly regarded field of nursing. Depending on personal preference, individuals can find work in many different settings. There are many different nursing degrees available at universities and colleges across the United States. Below are the top types of nursing degrees. You can click on the degree name to view detailed information on each and every degree, including degree requirements, available programs, and what career opportunities each nursing program has. Be sure to do your research to figure out what the best nursing degree program is for you! Brief course at a community college, technical school, hospital or Red Cross that teaches a student how to be a nursing assistant and usually enables them to take their state’s CNA exam and be in the state CNA registry. In some schools this is a prerequisite to the LPN or RN program. Generally one year programs at community colleges or technical schools that enables a student to sit for the LPN exam. Frequently these are certificate programs OR the first year of an RN program that lets you stop early or continue on for the RN. Some schools list that as LPN exit. LPN=LVN, some states call it licensed vocational nurse. Associate degree programs, basically two-year programs at community colleges, which lead to the ability to sit for the RN exam. Holdovers from the old days of hospital nursing schools. These are usually two-year programs that allow students to sit for the NCLEX-RN, but a true diploma program gives a diploma and not a degree. However, some diploma programs have teamed up with local universities or community colleges so that students take some classes at that institution and therefore get a diploma from the hospital school and an associate’s degree from the community college. These programs are listed as ADN programs. A traditional, four year bachelor’s degree that allows you to sit for the RN exam. An ADN program that allows students with a BA or a BS in a non-nursing discipline to take nursing courses towards an ADN and sit for the NCLEX-RN exam. Basically, the quickest way to becoming an RN if you have another degree. Generally, the accelerated programs are all about the same length – 12 to 16 months. BSN program that lets someone with a BA or a BS in a non-nursing discipline to take all the nursing content courses to get their BSN and sit for the NCLEX-RN exam. Generally from universities with 4-year BSN programs. Program for an LPN to finish the second year of a two-year program or return to school to get the associate’s degree and NCLEX-RN exam eligibility. Program for an LPN to get a BSN and sit for the NCLEX-RN exam. These are pretty rare, generally LPNs do an RN program and then an RN-to-BSN. BSN programs for either ADN or diploma nurses, often called “completion” programs. Frequently, these programs are offered by universities that also offer four-year BSNs and they can be part-time or online since they involve a lot of general courses. An MSN program that does not require a BSN prior to entry. Either 1) you will get your BSN along the way as part of their MSN program or 2) you have a bachelor’s in other discipline and they accept that. Many schools will just have you do their RN to BSN program and then do the master’s track, but some schools specifically offer an RN to MSN program. The traditional MSN program for bachelor’s prepared RNs. MSN programs run the gamut — they can be programs that prepare people for educator roles (teaching nursing students), in-hospital educator roles, administrative roles or advanced practice. MSN programs that prepare non-nurses with bachelor’s degrees in something other than nursing to become advanced practice nurses or other nurse leaders. They are generally called direct-entry, graduate-entry, master’s entry, or pre-specialty programs. Students get their RN first (the pre-specialty phase) and then continue on in the master’s portion. Some of these programs confer a BSN in the middle, most do not. Program for a nurse with a MSN to get a certification in another specialty or an additional credential. Frequently these can be done online with limited on-campus presence. A clinical doctorate (not a research/academic doctorate). Eventually these will replace the MSN as the advanced practice degree. Some of these programs are online for Masters prepared students. In some cases there are direct-entry DNPs or BSN or MSN entry DNPs. It will vary considerably since this is a relatively new degree. A traditional academic doctorate given by universities with graduate schools. Requires a Masters degree, generally, although there are some BSN to PhD programs out there.